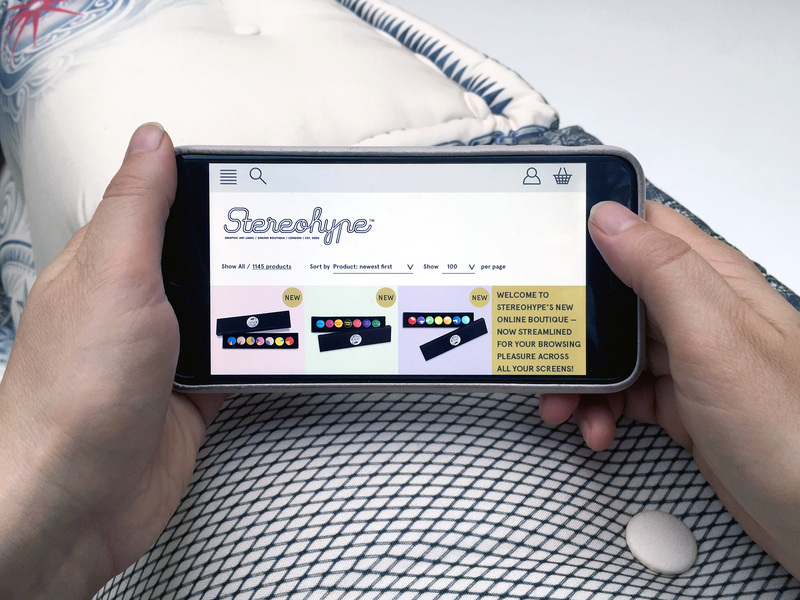 After long preparations and extensive fine-tuning we are at last very happy to announce the launch of the new responsive Stereohype website v.2 – streamlined for your browsing pleasure. ___ It was designed by FL@33 and programmed by our trusted friends at Huck und Fresow. 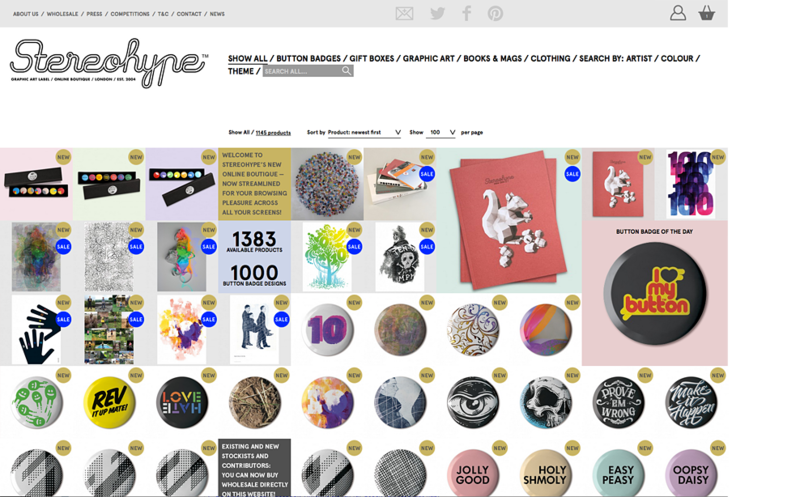 ___ You can now explore the entire range of Stereohype by making use of new product categories, tags, search filters and the responsive, generous and easy-to-browse layout. 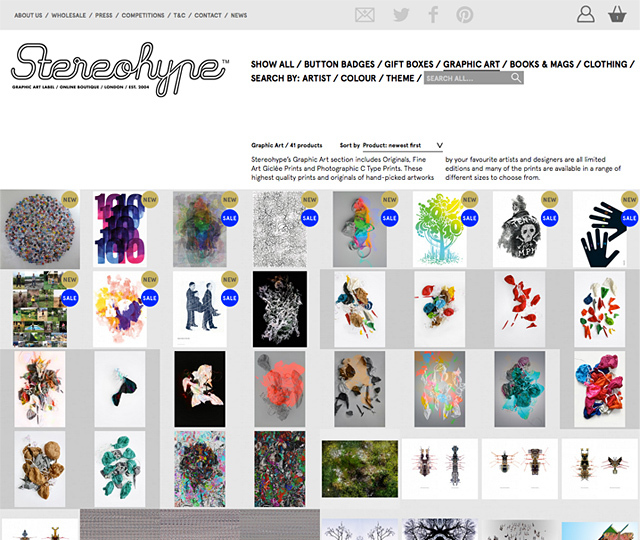 Quickly find what you are looking for or let Stereohype surprise and inspire you with the ever-growing collection. 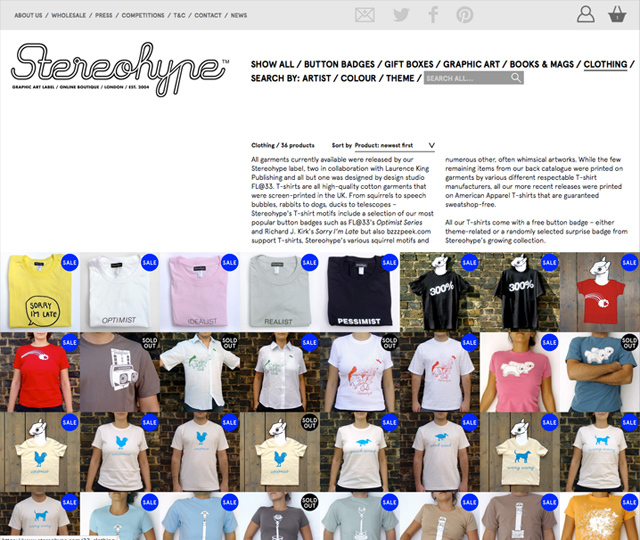 FL@33 launched the graphic art label and online boutique Stereohype in 2004. This first Stereohype website was designed with very different criteria in mind compared to what we did have to consider for the new incarnation. The old online boutique did us a great service for over a decade – but shortcomings became increasingly apparent as hundreds of products were added over the years. Patching up the website just did not solve the issues anymore towards the end. ___ Nowadays Stereohype’s expanding range already includes over 1,350 button badges by over 450 contributors, themed button badge gift boxes, books and mags and T-shirts and last but not least the freshly extended graphic art section that now also includes posters, fine art prints, photographic prints and original artworks. ___ The old 2004 version 1 (or rather 1.9999999999) was designed with only a couple of hundred products in mind. Without taking different formats and T-shirt sizes into consideration we have today over 2,000 products as our fresh new counter indicates on the homepage (figures were updated here in the meantime). The new website v.2 was initially meant to be ready for Stereohype’s 10th anniversary celebrations in autumn 2014 – and in time for our major retrospective Stereohype 2004–2014 exhibition in London. The design process however ended up teasing us to go the extra mile – which unsurprisingly took a few extra months. We are very relieved to have added our entire wish list to the new online boutique to make browsing – and buying – our products a swift, easy and pleasant experience. 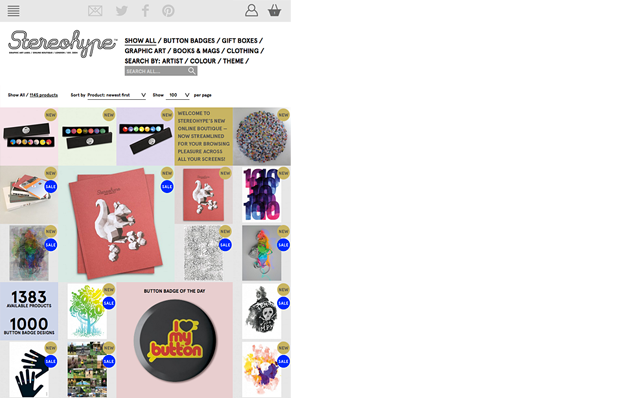 On computer screens you can now very quickly fill your basket using the custom-designed 'add to basket' icon under each product (on rollover). Sounds basic but we did not have this before. This new speedy option is especially practical for the currently already 1,000-strong button badge collection. ___ On touch screen devices one has to click twice (as the rollover function does of course not exist for these devices) but we still wanted to offer the alternative, in-depth info page there, too. ___ For touch screen devices the website was optimised at the time for the latest iOS 8+ on iPad and iPhone 6 and 6+. We will of course continue to monitor future compatibility. ___ All pictures were prepared in higher resolution to allow the badges to look as crisp as possible – even on retina screens. ___ A new zoom function allows to have a closer look at products – especially those cute little mini canvases that are our badges. ___ The 'Button badge of the day' (#BBOTD) feature that was introduced many years ago on social media channels is now an automated feature at stereohype.com’s homepage. Every day a random badge is being showcased and its price reduced by a third – but only until the next badge is being showcased. ___ The grid-based, responsive layout allows for as many products to be shown as the browser window allows – a game changer compared to the old website. ___ The two most important additions however are the 'search by' 'filters' – covering colours, themes and especially artist names – an extremely useful tool considering that Stereohype has over 300 contributors (over 500 even if you count all the involved individuals from studios and collectives). 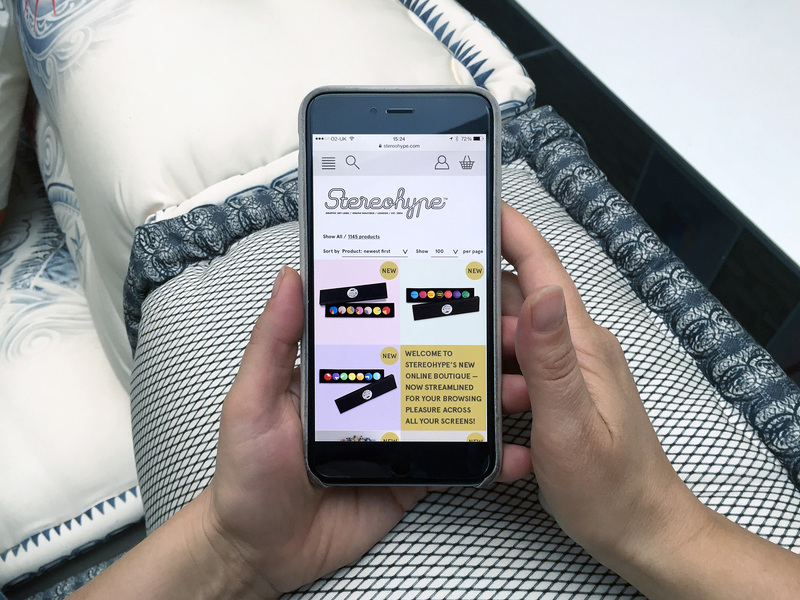 The other crucial functionality we added allows the website to also be a wholesale platform for registered Stereohype stockists and contributors – where prices change according to selected quantities. A simple CMS checkbox in the background transforms the status of registered users to be allowed to order wholesale. Finally they are now also able to enjoy the swift online shopping experience for their bulk orders. The illustrative and more colourful design elements of the previous website design – with all it's spray paint splashes, rainbow-coloured logo rollover and pink buttons and headlines – were all replaced with a toned-down and altogether more minimal visual language. ___ This is to allow the colourful products to shine more as the interface appears less dominant. Pastel-tones are used for product shots other than button badges whenever necessary. The main injection of bright colours used as part of the interface are currently a bright yellow that appears for rollovers and a nice deep blue for the 'Sale' icons. 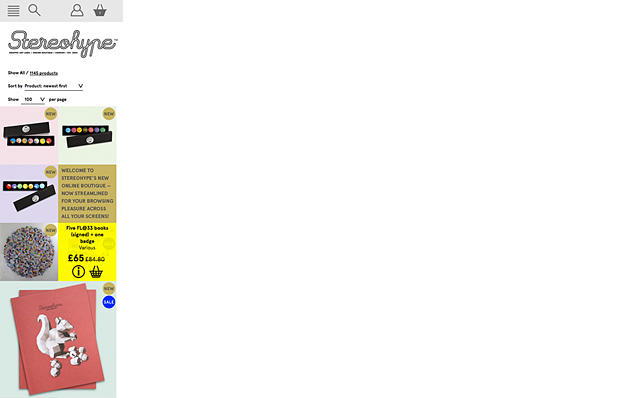 A subtle gold colour is used for 'New' icons. ___ Stereohype's maskot – the squirrel – found its rightful place in its current incarnation, too. The low-polygon squirrel sculpture from the exhibition and the book cover is shown on the website as a wire-frame animation loading gif. ___ Aperçu by Colophon Foundry is the new Stereohype house font. We introduced it with the anniversary book Stereohype 2004–2014, postcards and the signage for the retrospective exhibition of the same name in autumn 2014. 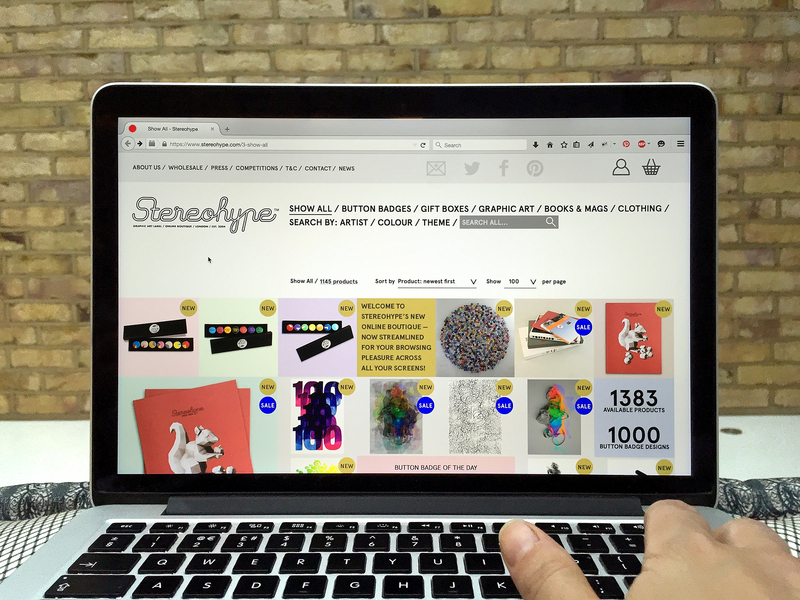 It's a worthy website relaunch that was overdue for Stereohype’s beautiful collection of graphic art gems and we are very happy to be able to share it with the world at last. ___ Fine-tuning and improvements will of course continue in the background and constructive criticism or flattering feedback is as always very much appreciated. ECV Lille, design residency 2019 – FL@33 masterclass workshop and lecture — FL@33's Tomi Vollauschek masterclass workshop and lecture at ECV Lille, France, 8 January – 1 February 2019. Lecture: 30 January 2019. 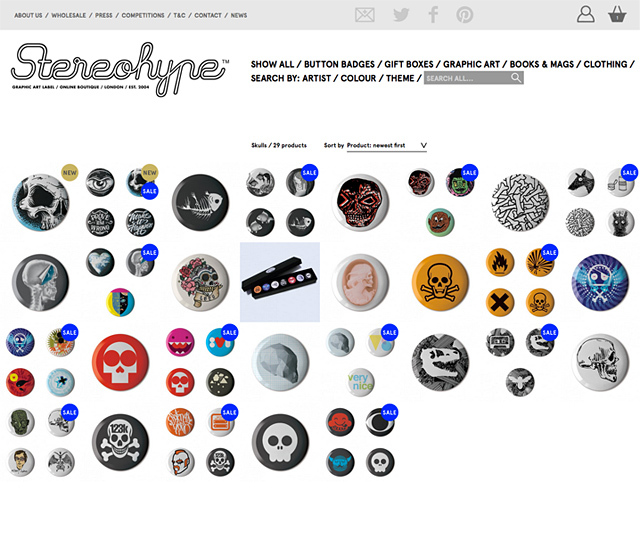 Stereohype 2004–2014, celebrated 10 years of Stereohype – FL@33's experimental playground and international platform – and the collection reaching 1,000 button badges by over 300 contributors. The exhibition opened as part of London Design Festival 2014 and as part of '160' – a series of exhibitions hosted by the London College of Communication (LCC) in London. 13 Sep – 8 Nov (Extra week added – exhibition extended due to popular demand, was 31 Oct), Lower Street Gallery, LCC, London, UK. 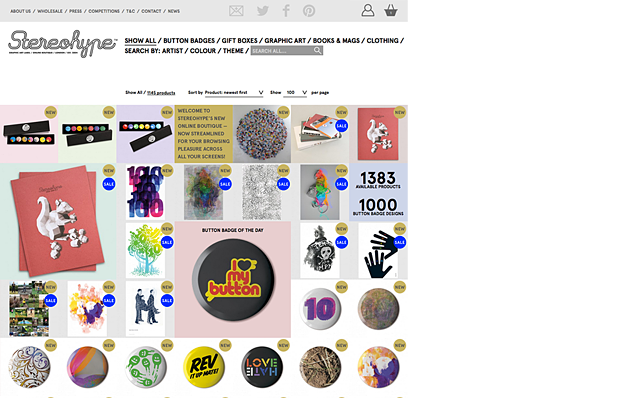 November 22nd, 2018 — Digital Arts article, See the Best Button Badge Designs of 2018. June 28th, 2018 — Please come and visit us at the amazing House of Illustration's Summer Fair 2018 this weekend in London, Saturday, 30 June 2018, 11am–5pm. March 23rd, 2018 — Some of the Stereohype mascot squirrels 2004–2018 were released as Fine Art Prints as part of Stereohype's growing Button Badge Motif Print edition. March 23rd, 2018 — 26 new button badges were added to Stereohype's vast collection and feature the long-awaited FL@33-designed Stereohype mascot squirrels 2004–2018 (and of course some nuts). 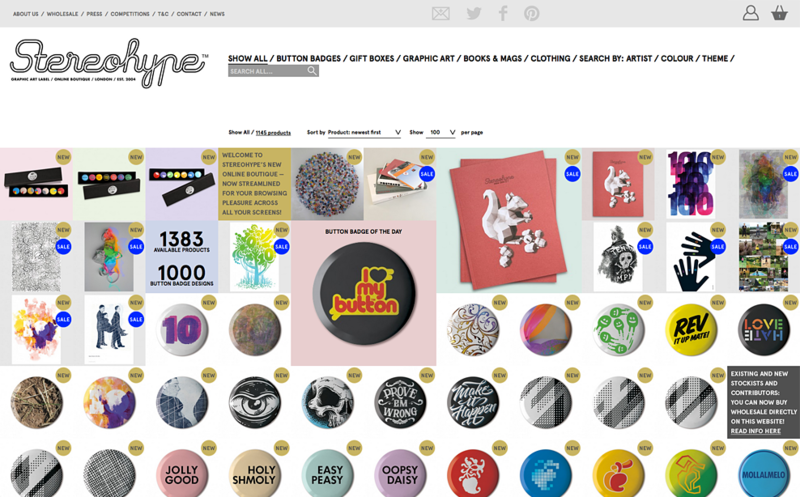 November 20th, 2017 — Digital Arts article, See the Best Button Badge Designs of 2017, London, UK, 20 November 2017. 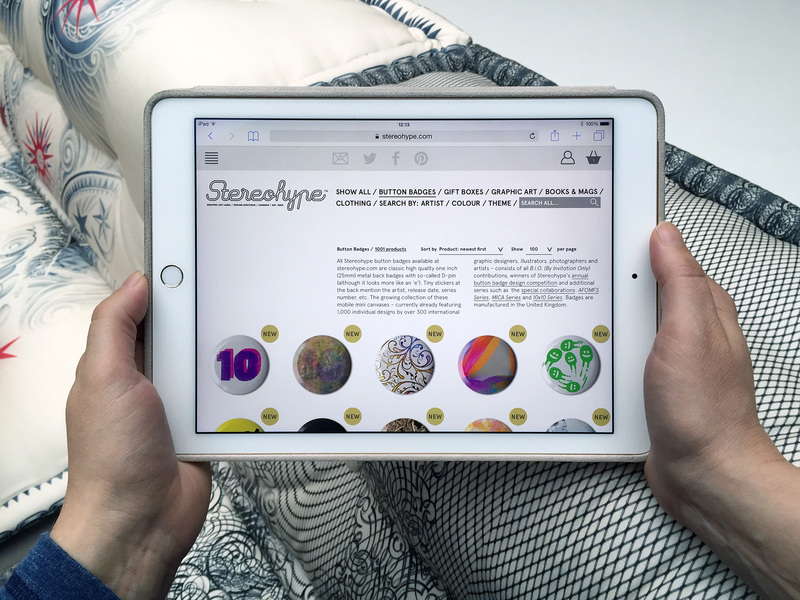 April 7th, 2017 — Stereohype launched this year's call for entries for the 13th annual Button Badge Design Competition and we are of course part of the jury panel again. Happy badge-designing and good luck! 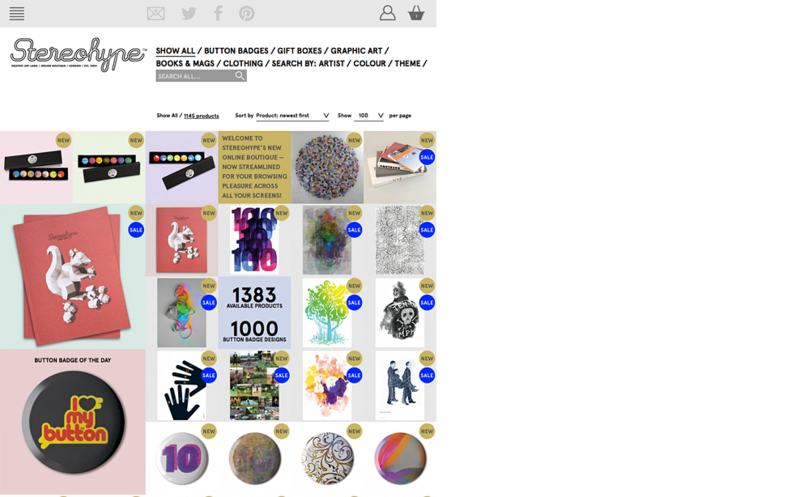 February 20th, 2017 — Digital Arts article, The Best Button Badge Designs of 2016 now available as prints, London, UK, 20 February 2017. December 2nd, 2016 — FL@33 deveopled a new logo for Stereohype's new edition Button Badge Motif Prints that will all be certified using the logo as embossed certification seal. December 1st, 2016 — Just launched: FL@33 deveopled a new range for Stereohype called Button Badge Motif Prints. The first 18 from potentially over 1000 motifs were just released – all designed by FL@33 together with an embossed certification seal that FL@33 also created. November 16th, 2016 — Digital Arts article, These are the Best Button Badge Designs of 2016, London, UK, 16 November 2016. November 12th, 2016 — The FL@33-curated B.I.O. (By Invitation Only) Button Badge Series 16 for Stereohype and was added to the graphic art label's now 1244-strong badge collection. June 7th, 2016 — Graphic art label and online boutique Stereohype launched a massive sale today – including 182 FL@33 products such as signed books, graphic art prints, button badges and T-shirts. 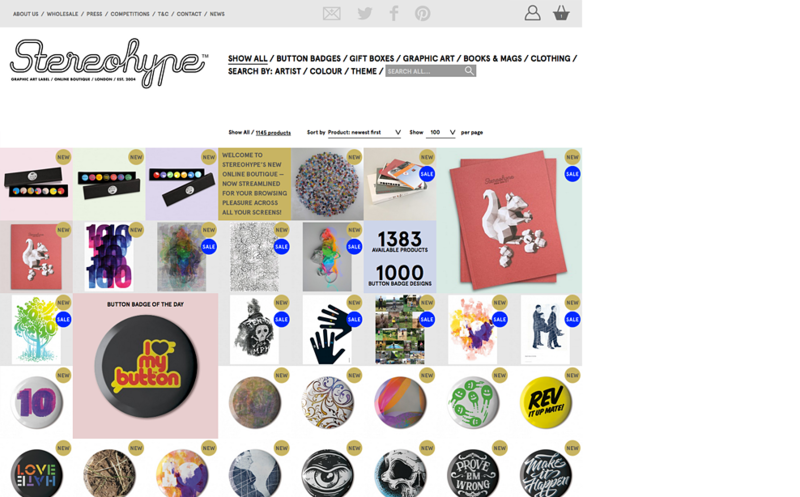 Voucher codes for extra discounts can be found on stereohype.com's homepage during the sale. April 28th, 2016 — BIG BADA BOOM! Huge surprise in this month's Creative Review: 8-page book review of FL@33-designed book The Story of Emoji by Gavin Lucas, a full page of our very own Mind Blown emoji and to top this up even mentions of Stereohype's fresh new Emoji Series button badges. April 15th, 2016 — FL@33's Tomi Vollauschek is heading back to London tonight after an exciting week as designer in residence at the ECV Lille, France, where he ran a 4-day workshop and gave an evening lecture. See a documentation here. April 12th, 2016 — FL@33's Tomi Vollauschek will give an evening lecture for students of ECV Lille as part of his design residency at the French college this week. March 2nd, 2016 — Mind Blown – FL@33's very own custom emoji created specially for the also FL@33-designed book The Story of Emoji by Gavin Lucas (Prestel). November 16th, 2015 — FL@33's now annual design initiative B.I.O. 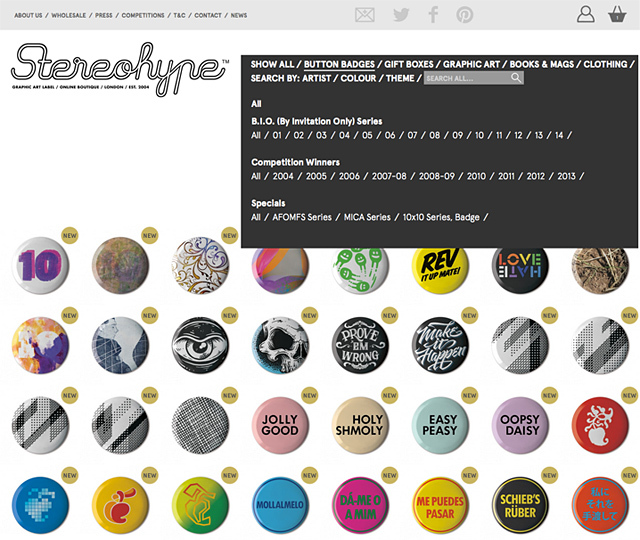 (By Invitation Only) Button Badge Series just went into its 15th round. B.I.O. Series 15: now available at stereohype.com. 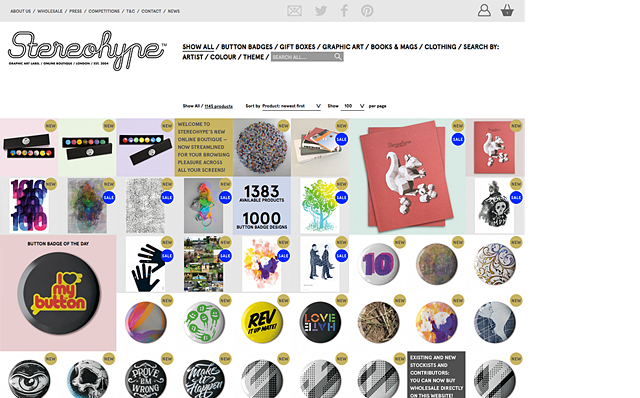 September 18th, 2015 — Only 3 days left to enter button badge design gems to this year's design competition by graphic art label Stereohype. More info and artwork guidelines etc on Stereohype's competition page. We'll also be judging. Good luck! 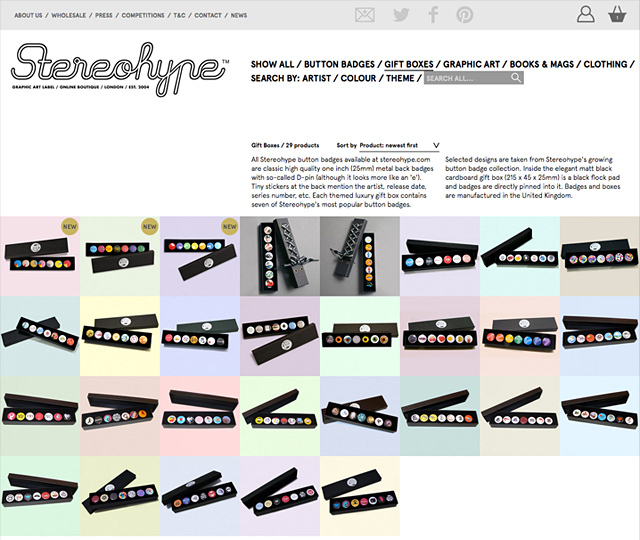 July 16th, 2015 — FL@33 will be part of the judging panel for the 11th time later this year to select the best of the best submissions to Stereohype's annual Button Badge Design Competition. The 11th call for entries has been launched and you can read all about it and get artwork guidelines etc on Stereohype's competition page. June 4h, 2015 — A box full of our superbly printed new T-shirt arrived today and Password1 is now available at stereohype.com! May 27th, 2015 — Update your weak passwords and secure the new FL@33-designed T-shirt – Password1. Screen-printed in black and enhanced with a heat pressed double hit of liquid gold. Secure yours now at stereohype.com! April 17th, 2015 — Steckenpferd: Designer-Badges. 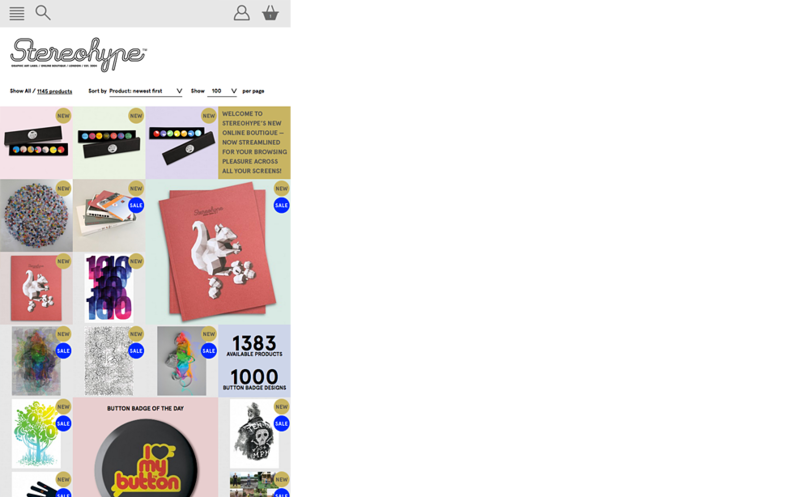 German Page magazine kindly posted an online article today about the freshly relaunched Stereohype v.2 website we designed. April 15th, 2015 — The 10 minutes-long video loop from the exhibition Stereohype 2004–2014 was uploaded and embedded in a dedicated project page we added to the documentation of the show. April 14th, 2015 — Two video clips from our 10th anniversary exhibition Stereohype 2004–2014 were uploaded to our Vimeo channel and embedded in the project page of our Stereohype Party Squirrel Sculpture. April 13th, 2015 — Today we launched the new html FL@33 Newsletter #1 (revised version) and with it a new FL@33 Newsletter Archive. April 7th, 2015 — DigitalArts interviewed FL@33's Tomi Vollauschek about the newly launched Stereohype v.2 website. 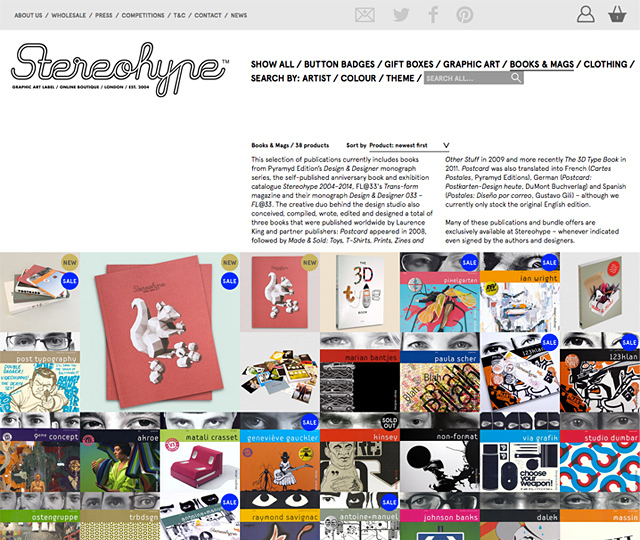 April 6th, 2015 — IdN in Hong Kong kindly selected the newly launched FL@33-designed Stereohype website for their Pick of the Month section. 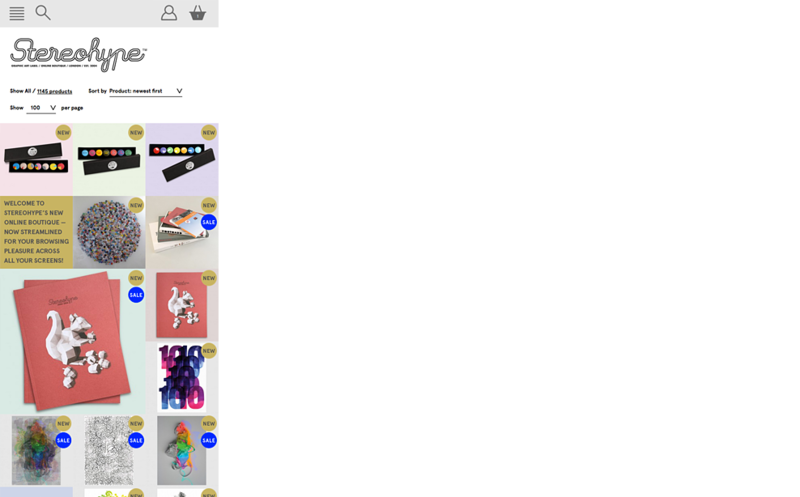 April 2nd, 2015 — Long-time supporters Netdiver kindly helped spreading the word about the newly launched FL@33-design Stereohype website v.2. November 5th, 2014 — It's Nice That features the 10 favourite picks from Stereohype's 10th birthday buttons as selected by Gavin Lucas – author of Button Badge Pin and Stereohype 2004–2014's intro. October 29th, 2014 — Breaking news: extra week added. Due to popular demand the FL@33-designed and curated exhibition Stereohype 2004–2014 was extended until 8 November, Saturday 4pm. October 20th, 2014 — Ten years of button badges, CR Blog posted a very nice article with interview excerpts today about FL@33's button badge activities such as our Stereohype 2004–2014 book, anniversary exhibition, commissioned posters and this year's B.I.O. Series. October 14th, 2014 — We finally managed to edit and post many pictures from our sister-company's currently still ongoing exhibition Stereohype 2004–2014 that FL@33 curated and designed. We also posted all the FL@33-designed and/or art directed exhibits – including more pictures from our party squirrel sculpture – and previews of Stereohype's 10th anniversary book that is now available at stereohype.com. September 10th, 2014 — Vinyl lettering for our exhibition Stereohype 2004–2014 was applied today. Almost there... The show opens on Saturday, 13th, and we hope to see you at the private view on Thursday, 18th.